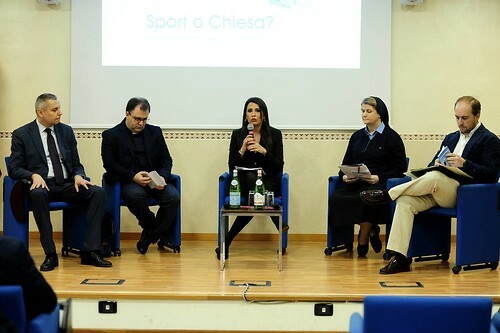 Among the events related to its 75th anniversary, the Italian Sports Centre (CSI) held a National Conference on 15th and 16th March attended by the regional and provincial presidents and respective ecclesiastical assistants. Santiago Perez de Camino, Head of our Dicastery’s Church and Sports Office participated in a round table on Saturday 16th together with the heads of the sports offices of various associations and of the Italian Episcopal Conference (CEI) and reiterated the importance of the lay faithful in evangelization and as coherent witnesses of Christian life inside and outside the sporting community. In reply to the words of Don Alessio Albertini, Ecclesiastical Assistant of the CSI - “The provocation in the title ‘Church or Sports?’, purposely wanted to make us reflect on our way of understanding sport”, Santiago Perez de Camino affirmed that “ there is a very strong link between sport and the Church thanks to parallel paths. If sport places man at the centre of the game, it plays the same game as the Church. As Pope Francis has said on many occasions, sport practiced in the proper way leads to beauty and therefore opens the way to God. Sports without the Church would lose a unique ethical reference, while the Church without sport would lose that drive and aid which enables her to arrive where she could not go alone. In fact, sport helps the Church to meet people”. Questioned about the relationship between the parishes and the oratories, Santiago Perez asked himself: “Why does there necessarily have to be a separation between coaches and catechists? Why not coaches and catechists? The joint responsibility of the lay faithful in the Church today is essential as the Pope reminds us. Through sport, the Christian lay faithful can contribute to the good of the community. A priest doesn’t have to be a coach or vice versa, but sport and parishes have the same mission, to bring God to the people. For this reason, there is no Christian sport but a Christian vision of sport. The sports associations must take special care in coaching before they entrust young people to someone who does not display coherence in life. Today with so many broken families, there is much that a coach can do. Pope Francis once said to a young university student: the last thing anyone should do to bring someone closer to God is to talk; first he needs to bear witness of how to treat people”.